MSG Entertainment has announced that Boston will see a new production of the "Radio City Christmas Spectacular," when the world-famous Radio City Rockettes kick their way into Boston's Citi Wang Theatre this holiday season from December 2 - 28. This year’s show will hit the road with nearly 20 trucks, making this the biggest production of the 'Christmas Spectacular' to play in a theatrical setting. Along with re-imagined Rockette favorites, including the high-energy tap-infused number, “12 Days of Christmas,” the Rockettes will showcase their signature precision dance style as they debut some of the most challenging and dynamic Rockette numbers yet conceived. In a brand new scene, “New York at Christmas,” the Rockettes will board a life-like double-decker tour bus taking audiences on a guided tour through the streets of New York City. This new scene includes show stopping choreography coupled with the landscape of iconic New York City holiday landmarks and culminates in the crossroads of the world, Times Square. Santa Claus will take center stage in two new scenes: “Magic is There,” as Santa takes two young brothers on a journey to the North Pole, and “Here Comes Santa Claus,” revealing how Santa can be in multiple places at once. 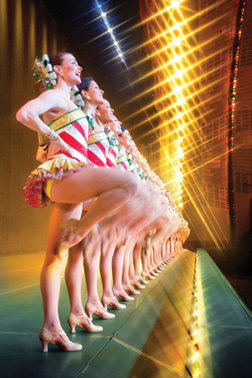 Traditional cherished numbers such as “Parade of the Wooden Soldiers,” which continues to set the standard as the signature Rockette number for precision performance, and “The Living Nativity” which have both been performed since the "Christmas Spectacular’s" inception in 1933, will remain a vital part of the show’s core. In 2010, the “Christmas Spectacular“ was enjoyed by nearly two million people. In its 17-year combined history outside of New York, as well as the production at Radio City Music Hall, the show has played to more than 70 million people. For tickets and information, stop by the Wang box office on Tremont Street, call 866-348-9738 or visit www.citicenter.org.